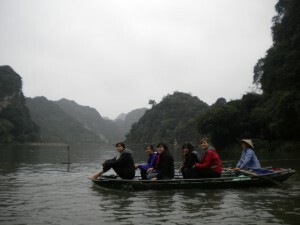 For this blog, I’m going the photo journal route… we’ve been in the north of Vietnam for almost a month now, and have seen an incredible amount of scenery and all of its history. Here are some of my favorite photos of this past trip, enjoy! 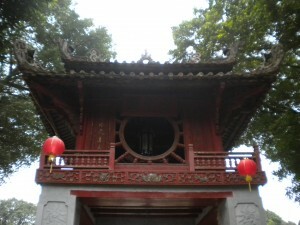 This is the Temple of the Moon at the Temple of Literature, the first University in Hanoi. If you have a 50,000 dong bill around, its printed on there as well. Our tour guide was also an American professor working at the Hanoi University, Douglas Jardine, and could not have been more stoked about the history of the temple. I had no idea how excited someone could be about Confucius and architecture. His attitude was infectious, and all of our inner-nerds were happy to come out to play. This is emily. Its the first night of the Cambodian new year. She is being attacked with baby powder. On of the girls on our trip, Carol, is Cambodian, and found a group of Cambodian students in Hanoi who were having a celebration of their own. Emily and I tagged along, and did not regret it. 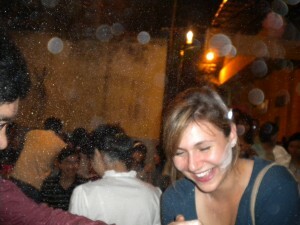 It was one of the greatest nights of the trip… there was loud tecno, beer, and, of course, baby powder. I hope that I can introduce this tradition to the US, cause it will surely make any good party into a great one. Douglas Jardine, the professor who took us to the Temple of Literature, also took us to Long Bien Bridge. 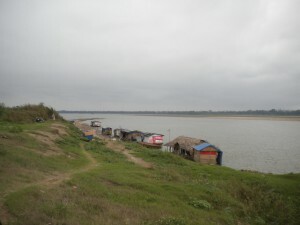 There is a large community living on an island on the Red River who have been marginalized, and essentially pushed here. There are houses communities which have quite literally been pushed to build their houses on the river, since you cannot a house which isn’t built on land. 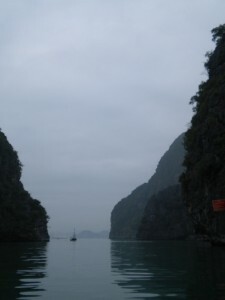 They have no legal documentation and are therefore have little to no rights in Vietnam . The second time we visited the island, it was the night after a huge storm, and seven of the ten houses had been destroyed. But, when we talked to the people who had lived in those houses, they were nothing but smiles. LIfe is precious, and that was a harrowing reminder. 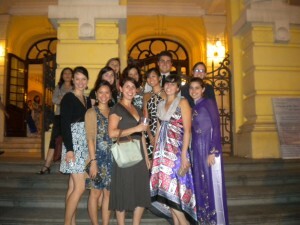 Our academic director, Thanh, spoiled us and took us to see the Hanoi symphony at the Opera House. I had no idea how much I missed classical music! (Don’t tell Christophe Chagnard that I haven’t played my cello for almost three months!) The opera house was built by the french in the late 1800s, and is quite the building. We saw the “reconciliation concert” where the conductor of the boston symphony came to Hanoi to conduct New World Symphony. Although many members of the audience haven’t gotten the memo on cell phone etiquette, it was a great night; the night was made even better when Ursula (in the audia) was interviewed by the local paper.